Beets, aka beetroot, is fast becoming the natural weapon of choice for athletes, as well as people looking to improve their heart health. The reason is simple: beets are loaded with nitrates. When you eat them, you break down the nitrates into nitrite, then into nitric oxide. Nitric oxide is coveted amongst athletes due to its ability to increase endurance and muscle pump. Nitric oxide also helps to relax blood vessels, improve metabolism and support heart health. DIGESTION: Beets get your digestive system in rhythm. Insoluble dietary fiber helps reduce the risk of constipation, and other digestive issues. There are about four grams of dietary fiber in every cup of beets you eat. They also contain betaine, which helps prevent the build-up of homocysteine. Homocysteine is an amino acid that can harm blood vessels and lead to heart and circulatory problems. Be aware that these red root vegetables have a tendency to add a red tint to everything passing through your digestive system for about 24 to 72 hours. LIVER HEALTH & DETOX: Good beets fight bad fats. The betaine in beetroot improves many functions that benefit your health. This amino acid can help prevent the build-up of fat in the liver. 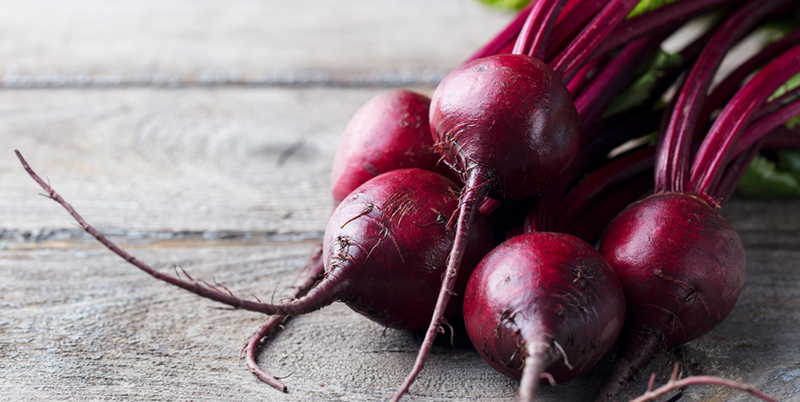 Research has shown that betaine can have detoxifying effects and support liver function. ANTIOXIDANT HEALTH: Fight free radicals with the power of pigment. Beets also contain betalains. Betalains are the nitrogen containing pigments that give them their red color. As a powerful antioxidant, they fight against free radical stress in the body. MIND POWER: Boost blood flow to the brain. Beets don’t just boost your circulatory system, they also enhance blood flow to your brain. Their high levels of nitrates and antioxidants help improve neural blood flow, specifically to the frontal lobes, which are responsible for many cognitive processes. ATHLETIC ENDURANCE AND STAMINA: Beat your best performance. Beetroots have been getting a lot of press these days because of their positive effects on sport performance. Studies on high level athletes suggest that beets can improve endurance and stamina. The nitric oxide your body produces from the nitrates in beets helps to improve blood flow to the muscles and enhances oxygenation in the blood. An alternative way to get the benefits of beets. While you can harness the power of beetroots just by eating them, not everybody likes their taste or has the time to prep them. For times when you want the nutritional power of beets in a delicious and convenient form, check out Green Tea + Beetroot + Fiber + MCTs and the new One More Rep™, a powerful pre-workout bolstered by the power of beetroot powder! This innovative, all-in-one supplement combines the antioxidant power of beetroot with a combination of powerful antioxidants and health promoting nutrients. This revolutionary pre-workout is setting the trend with natural, performance-boosting ingredients like beetroot powder, citrulline, betaine and carnitine. The result of ever-evolving research in the labs and the gym, One More Rep™ is the cutting edge of fitness technology. For more information on supplementing with beetroot powder, check out: The Benefits of Green Tea, Beetroot, Fiber and MCTs.